accumulation. vibration. color. excess. the body engulfed by a flood of images. fractures, fragments, particles sped up and slowed. an entrance, a passageway, an exit: transfer, movement. delayed arrivals, departures... through a wall of color, reflections, deflections, sounds of the spectrum. pulsing light penetrates the transparency of a once solid glass field broken apart by color, shards of imagery, an aerie, stars born and destroyed - explosions, new textures of light and space. 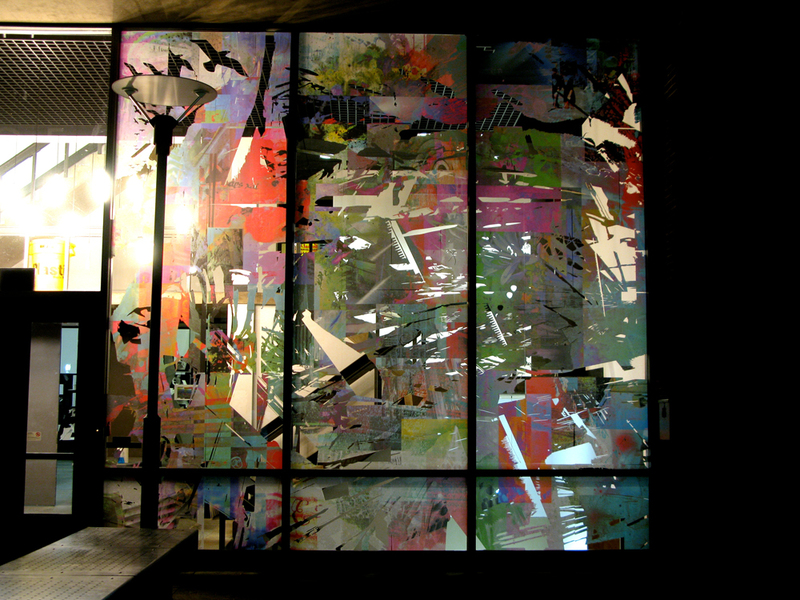 installed on the glass facade of meyerson hall at the university of pennsylvania school of design - a 16' x 50' translucent glowing mural. 144 laser cut panels of two view HP printed laser jet paper. fabricated, cut, designed, and installed by the artist. in collaboration with nadine kashlan.